Filo Tiatia made his debut for Wellington in the 1992 National Provincial Championship, playing for the side through the advent of professionalism and eventually representing the Hurricanes in the Super 12 from 1996 until 2002. Tiatia won two All Blacks caps in 2000, his first as a try-scoring replacement in a 102-0 rout of Tonga and his second as blindside flanker against Italy, again crossing the whitewash. In 2002 Tiatia packed his bags for Japan, playing for four seasons with Toyota Verblitz before taking up a contract with the ambitious Welsh region Ospreys in 2006. Tiatia became a cult figure in West Wales with his strength and appetite for work around the field. 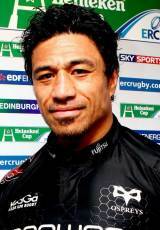 In 2008, Tiatia announced his wishes to join the Ospreys coaching team following is retirement from playing.